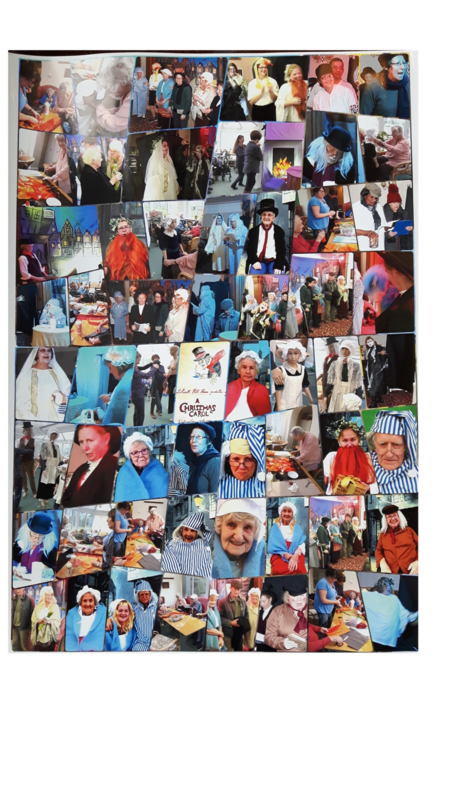 …for their boldness, creativity and inclusion of the wider staff team in their use of the A Christmas Carol panto box. The panel also Highly Commended one other entry – Eulyn McClean’s (Princess Louise of Kensington, Sanctuary Care) for her demonstrable building of anticipation and appreciation in the home’s use of their first activity box, Icons Photo Shoot. Great work all those involved and congratulations to both homes. Josephine, Gaby and Sotwell Hill House, enjoy creatively spending your prize! ...and everyone stay reading for the winner’s story which is coming soon! Evidence of Outstanding Activities Competition – Winners story! Lindsey Salhotra, Activities Coordinator at Milton Ernest Hall (Majesticare) recently won our winter edition of the Evidence of Outstanding Activities Competition. This is her home’s story. The team at Milton Ernest reflected that residents were “withdrawing and not joining in in certain situations”, especially when they felt that they “couldn’t communicate”. This shared awareness was initially prompted via the observation of a resident who “was conscious of her speech and its deterioration and believed that people could not understand her or want to communicate with her”. This event was a roaring success. The resident who had been withdrawing "got involved and even made membership cards…it was great to see her out of her room and in the small cosy space [alongside other residents at risk of social isolation], where she seemed more comfortable, less intimidated and chatted one to one with other residents." 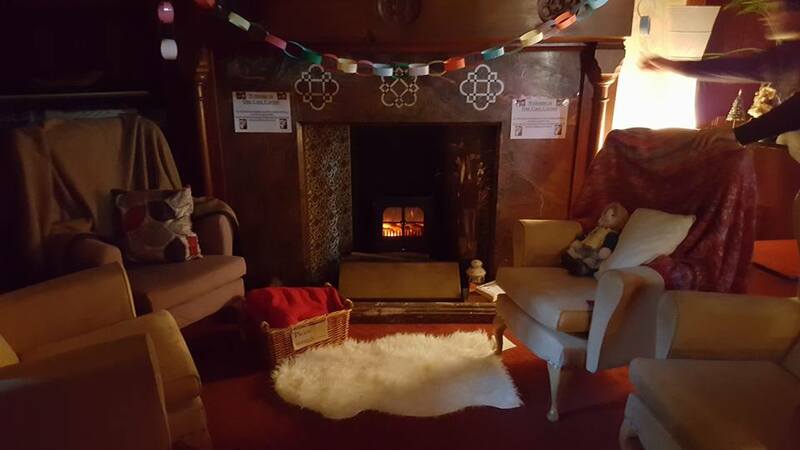 The Snug N’ Cosy theme also inspired further activities and events within the home: staff and residents “tried their hand at slipper making, decorating and enjoying the smell of gingerbread men, pampering ourselves with hand massages and also our Hygge day which included adopting a teddy bear!" Subsequent actions undertaken by Lindsey and the team aim to further embed the positive changes resulting from the book club and the hot chocolate bar to result in ambitious, lasting effects. “We are considering incorporating [the hot chocolate bar] into our regular fortnightly breakfast club and using [it] as a drop in event, also.” And, along with contacting local speakers and authors, to see whether they can host a book signing or a talk about a local book, there is now a “board in the hallway where all those passing can jot down their favourite book for us to discuss at future meet ups.” They have also arranged for a group of local historians to visit the home in February, where they hope to inspire the use of stories from the home’s history within the historians’ next local book. So well done to Lindsey and the team for their deserved victory; for their inspiring and comprehensive use of the Snug n Cosy box; for the considered and detailed entry, which demonstrated intentionality in design, thoughtful and creative planning, considered delivery of new ideas, impact with residents, family, the home community and a resident at risk of isolation; and your actions taken to embed positive change! …for her inspiring and comprehensive use of the Snug n Cosy box; her considered and detailed entry demonstrating intentionality in design, thoughtful and creative planning, considered delivery of new ideas, impact with residents, family, the home community and a resident at risk of isolation; and her actions undertaken to embed positive change. The panel also Highly Commended two entries – Paul Turvey’s (Fernhill House, Majesticare) for his bold design and for building the home community with an impressive large scale event inspired by the Icons Photo Shoot box; and Josephine Butterfield’s (Sotwell Hill House) for demonstrating the new opportunities created for residents in using a box to inspire and build a new relationship with a school, and for embracing the possibilities and embedding the change. Great work all and congratulations to Lindsey and all those at Milton Ernest Hall Care Home! Enjoy creatively spending your prize! ...all three of these stories are soon to be expounded upon and published as individual blogs, so stay reading! She actively sought to change this dynamic and to increase staff enrolment and engagement. The ‘1960s Fashion Show’ box provides support and materials for participating homes to create their own 60s items and to hold their own fashion show. Amy creatively introduced a competitive element to excite motivation: Maidstone Care Centre’s suite would compete and a trophy awarded to the floor with the best costumes! 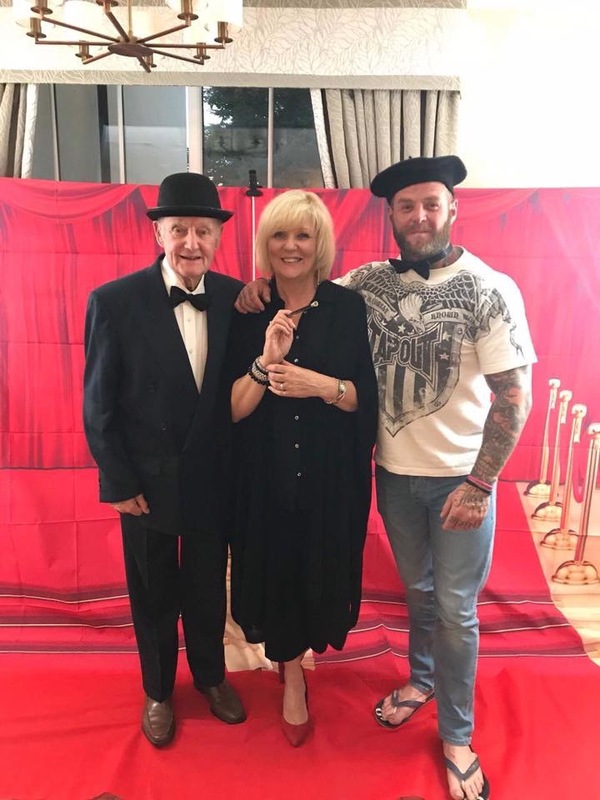 On the day of the fashion show, the opportunity to further extend the impact of the event saw wider community involvement, with residents from Kesson House (another RCH home) invited to attend and act as impartial judges! “We really took a step back to the 1960s. The lounge underwent a magical transformation: there was a catwalk with a backdrop, lights, music, a judges’ table, a compère and rows of audience seating. “The models entered wearing a combination of outfits reflecting the chosen era. Margaret donned long boots, headband and wig, whilst Albert was unrecognisable in his long purple wig, flared trousers and sunglasses. 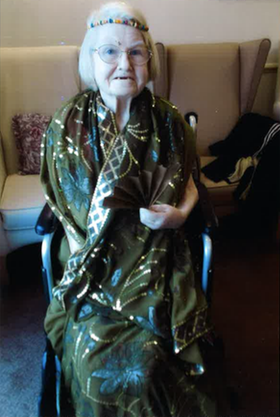 Other residents wore mini dresses made from chequered tablecloths and tie-dyed scarves. 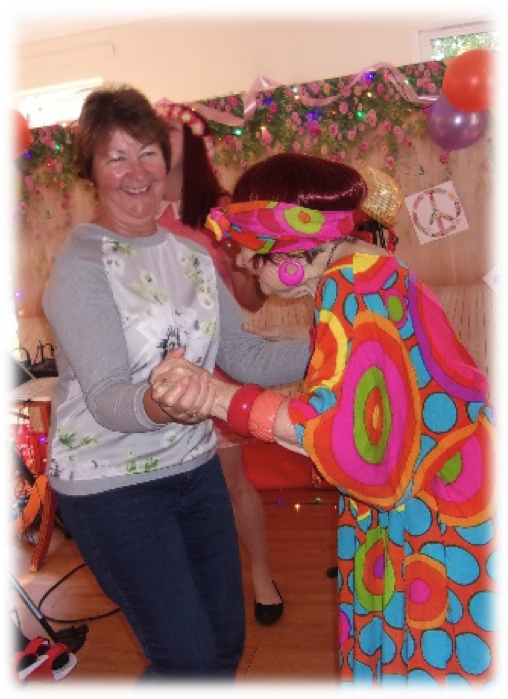 “Resident Sylvia was adamant that she didn’t want to take part, but when it came for the judges to retire and make their decision, she called out “What about me?” - put a hat on and began dancing!” Amy, Activities Leader. “I loved it. I went to sleep smiling. I haven’t done that in ages.” Sylvia, resident. Great job Amy and to all those involved; and congratulations to the Albert and Rochester Suite for winning the fashion show trophy! …for her articulation of and drive and support behind the home’s whole hearted community use of the 1960s Fashion box; and for ensuring this impressive engagement and momentum is maintained and lasting impacts sustained. Amy also deserves further credit, as this is the second time she has won this competition! The panel also Highly Commended another entry – Lindsey Salhotra’s from Milton Ernest Hall Care Home (Majesticare) – for her inspirational building of her home’s community. Both of these stories are soon to be expounded upon and published as individual blogs, so stay reading! Great work guys and congratulations again to Amy and all those at Maidstone Care Centre! Enjoy creatively spending your prize! Gemma Smith (The Grange, Forest Healthcare) was recently announced the summer winner of our Evidence of Outstanding Activities competition. Her entry was detailed and well written and clearly demonstrated the transformative connectivity, inclusion and engagement - both staff and residents - achieved through her skilful actions. Homes participating in the Outstanding Activities programme receive a creative resource box every month to support innovative approaches to person-centred activity. On receipt of a new creative resource box, this month "the Marvellous Motoring Map box" Gemma roused interest and curiosity by purposely opening the box in front of residents, who had sleepily gathered in the lounge (‘it was just after dinner and most residents had taken a little nap’). She took the contents to each resident, allowing them the opportunity to ‘handle the contents, ask questions and make suggestions on what to do’; she pinned the large map of the UK to a mobile board, so that everyone could clearly see and had access to it. She moved around the room, prompting conversation by asking residents open questions about their favourite holiday destinations, where they had travelled and worked and lived; and to name and tell stories about places that were emotionally significant for them. Gemma’s transformed the home environment from quiet and soporific, to one of vibrancy. Her creativity enabled the community to find value in what they were doing and to make unexpected discoveries. Gemma’s plans on upscaling the activity to include a world map and to link all the points together to show where all the staff and residents at The Grange have come from also demonstrates the commendable ability of continuing to create in response to emerging value; and will likely lead to ongoing transformation, community fostering and engagement for those at risk of isolation. We can’t wait to see it! …for her use of the Marvellous Motoring Map activity box to enable residents control, to involve everyone at participation levels comfortable and tailored to the individual and for demonstrating creativity in response to emerging value. The Grange are our first double winners of the competition and clearly demonstrated transformation and connection with this winning entry. Well done to all! The summer competition also saw the panel highly commend two entries: Hamble Heights (Encore Care, submitted by Vanessa Duggan and Zoe Morris) and Abberton Manor (Heritage Manor, submitted by Jonathan Walton). Hamble Heights’ entry demonstrated the home’s inventive approach to bespoking the boxes into additional, exciting and interesting activities for their community, taking everyone on new, creative adventures. Vanessa and Zoe’s inclusive approach to involving all in the home is commended as refreshing and very welcome. This approach has since contributed to the alteration of processes and practices within the home and supported the discovery of new preferences. 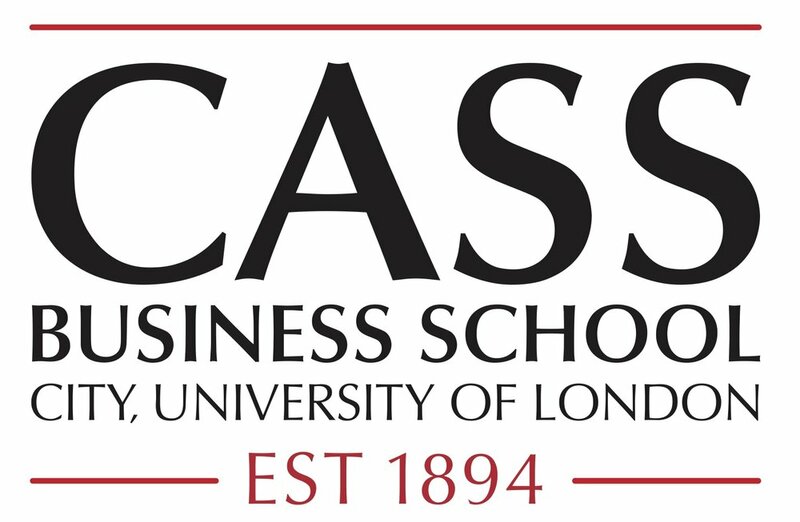 The panel wish to commend Vanessa and Zoe for noticing, valuing and articulating the benefits of this approach and for highlighting its transformative effects throughout their competition entry. Abberton Manor’s entry demonstrated their skilled use of the activity boxes to promote and support community building and intergenerational work. Pairing with Langenhoe Primary School, residents and pupils interact and enjoy the box contents together, creating a ‘real buzz of energy’ and a more vibrant care culture. The transformation explored through this entry was warming and deserving of such high commendation. Great work all! The autumn competition closes on November 1st, so submit your entries and stay tuned for upcoming winners! Harold lives at the Millings Care Home at Bedale in North Yorkshire. It was his idea to go ten-pin bowling and it was Sandy the Activity Co-ordinator who whacked the idea onto the home’s ideas matrix. The ideas matrix at The Millings care home in Bedale, Yorkshire has been in operation for many months and brings a lively commitment to both valuing ideas and getting good ones into action at the home. Anyone can contribute an idea which progresses round the 4 zones of the matrix. The sections create an ideas pathway from: Any new ideas to What we have planned to What we are doing now ending with What we have done. 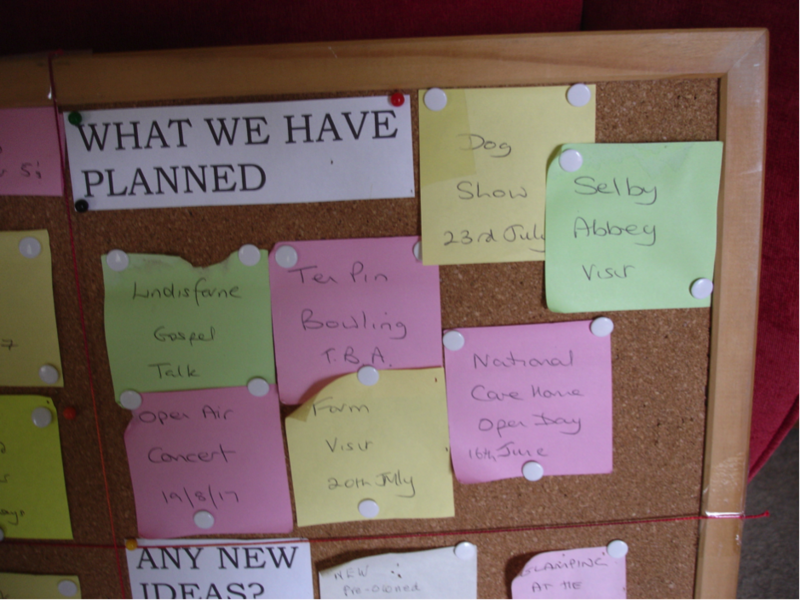 The board helps to involve everyone in contributing ideas for engagements and events and to tracking the home’s achievements. This home is particularly good, Outstanding in fact, at providing a diversity of intriguing age appropriate events for residents to choose from. Craft sessions are often done for a grander purpose and outings have high priority. For example, mandala making for the ‘Mandala Walk’ being planned for the garden. So Harold’s idea had made it to the ‘what we have planned’ section by the end of May. In June Harold, accompanied by 5 other residents, Sandy and Wendy undertook the 45 minute drive to the the Hollywood Bowl in Teesdale. Everyone held their breath for Harold’s effort on the lane. And imagine their delight when he succeeded in getting a strike on his maiden bowl. This proved to be the first of a total of 4 strikes for Harold on his way to a winning total of 110 points! On the Spectrum - of truth and lie telling in dementia care and support …..
A recent story I read from an Outstanding Care Home we work with re-peaked my curiosity about truth telling in dementia care. A subject of huge pertinence to those supporting people living with dementia either as practitioners or family carers and one that has fuelled many a debate over the years by those trying to find a path between ‘therapeutic lie telling’ and the preservation of trust and autonomy for people with dementia. The story was about an activity coordinator responding to a resident worrying about money by creating her a ‘false pay packet’. A creative response, which worked in that it restored the resident to her more usually enjoyed level of well-being. A wanted outcome achieved – yet this story is just a slim segment of a bigger practice issue, namely, how far should we go with supporting someone else’s reality (?) - and it made me wonder. It made me wonder just how many times a day people supporting those living with dementia make, or avoid making, similar decisions across the UK. I would guess its potentially a very big number every day – and some people quite understandably will just not know what to do for the best. After all, it takes a certain amount of confident risk-taking to introduce something that is essentially unreal/false on the basis that a person will find it meaningful and gain well-being benefits – it’s a gamble that not everyone will take. More than that, some people certainly wouldn’t do it, whilst others most certainly would and others whilst trying to be kind will risk being clumsy. The report contributes usefully by pulling together and articulating a wide range of stakeholder views and expertise, offering a scale for responses and interventions. 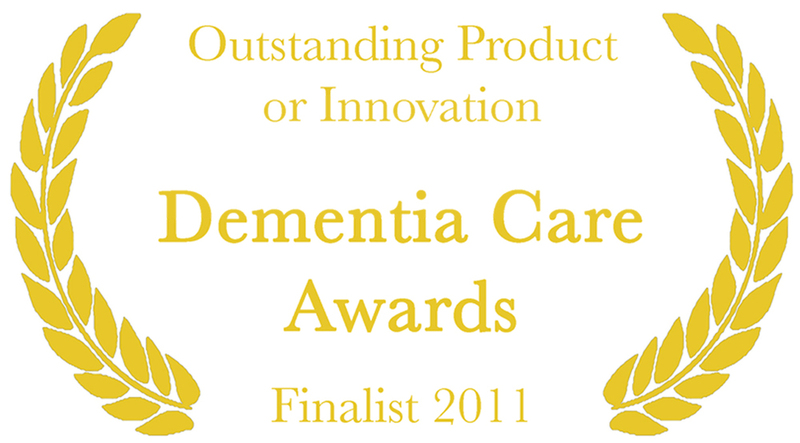 It recommends that care staff receive training on this as part of general dementia communication training. More than this I would certainly want care leaders to have the awareness the report provides and for senior care home staff to have this resource when care planning and creative problem solving – it will boost worker confidence and support better outcomes. So to help stop me wondering make sure your care leaders, in house trainers, managers and problem solvers know about this report by forwarding them the link. ...for generating creativity & growth, demonstrating responsibility & generosity and sparking multi-level leadership with her and her Home’s subsequent use of the Winter Arts box. Reflecting on a latent opportunity to introduce and further enhance participants’ use of imagination during art and craft exercises, Samantha led discussions with residents on art and favoured artists. An important change she implemented as an outcome of these discussions had her enabling residents to create their own works, rather than simply colour preselected images. Head Office were contacted, cheese, wine and crackers were sourced, a photographer was present and the opening made it into the illustrious pages of “The Carer” magazine (to view the article, please visit: http://thecareruk.com/residents-open-their-own-art-gallery-at-ash-court/)! So inspired was one reader that he/she anonymously donated art materials to the home, and others have come forward enquiring about buying some of the works! "The result was fabulous. Many residents, family members and staff got involved, dressing up as cowboys, Indians shooting each other, holding props and having fun. 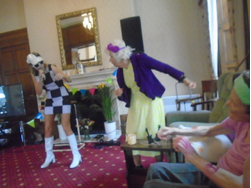 We also asked staff to dress up as cancan dancers, where we showed the residents a dance. We did this on all 4 floors getting as many people involved as much as possible…even our home cat! The home was full of fun and we made our comic A3 size for all to read and look at the pictures." Great work all; and fabulous demonstrations of the capacity for transformation and connection and growth that can be enjoyed through well-crafted activities! It’s Dementia Awareness Week and I took a peek at the Alzheimer’s Society website to see what was afoot. I was interested to encounter the public facing platform of this important appeal week. The message is simple - we must all unite against what is set to become the biggest killer in the UK to raise funds that will support a better life and better responses for people diagnosed and living with dementia - crystal clear and certainly a fighting campaigning stance in pursuit of crucial and necessary aims. But it left me a bit puzzled. Whilst understanding the desire to compel us all to exceptional action to raise funds I found it, perhaps perversely, uninspiring to be invited to ‘fight’ or to see dementia personified as ‘a killer’. This to me over milks the fear card and leans us back into the helplessness of the dominant medical model perspective we tried so hard to escape in the seventies and eighties. To me the biggest threat to us all from dementia is not being killed by it, that’s not the scary part – it’s about us being socially disabled in ways which have us suffer unnecessarily before we die, whatever the final cause that is declared on our death certificate. 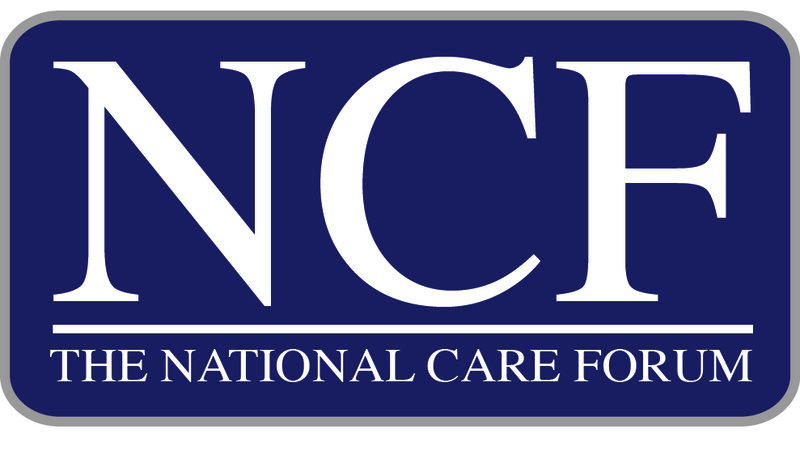 My personal inspiration this week has come from a care worker taking an interesting journey to support a better life for someone living in care - a story that turned life around for someone in care. An Outstanding Year of Outstanding Activities! 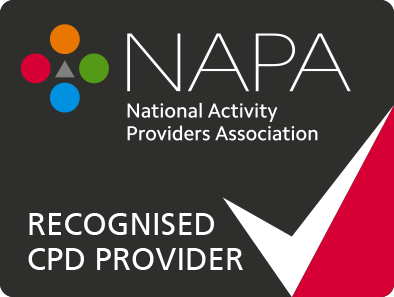 The Evidence of Outstanding Activities competition has continued to provide a great insight into the wonderfully engaging, inclusive and transformative work that programme participants are creating in their services. Autumn – Lynne Lovell (Ashley Gardens, Healthcare Homes) for her abundant and playful use of The Great Exhibition box to support an successful, existing event. This year has also seen many entries Highly Commended , from Marie Dasylva (Torkington House, Greensleeves) and Beverley Hillier (Roseacres, Advinia Healthcare) for their ability to enrol others: volunteers, family members and colleagues; to Gareth Harding (Harleston House, Greensleeves) for his leadership and playful approach to the Panto box, creating opportunities for staff to make connections in a new way with residents, relatives and each other. Richard Lever (Forest Care Village, Forest Healthcare) for his creation of opportunities for acknowledgement and pride and involving residents across multiple floors and throughout the whole care village. Richard’s leadership in the creation of the home’s music video encouraged people to involve themselves in activities and participate in ways never previously seen before; yet he also stretched beyond the creation of this video to hosting a Premier Event Showing – complete with refreshments – to residents, staff, management, relatives and visitors, which remains an on-going source of engaging conversation. Rebecca Lee (Healthlands, Canford Healthcare) for her impressive reach, resilience, playful and creative impact in the face of difficult circumstances. Having initially struggled to engage the support of her colleagues and articulate the beneficial effects of her shared vision, through being bold and spontaneous, and encouraging two of her colleagues to join her in dressing in items from the Rebel and Icons boxes, Rebecca experienced a successful, home-wide transformation in attitude. Traveling through the home, she and her colleagues received many comments from staff, residents and visitors, sharing items and inspiring curiosity; which lifted the spirits of the whole home and has since made it much easier for her to solicit on-going peer support. Every submission we receive to the Competition is a wonderful testament to the invaluable work and inspiring, creative transformations that all who contributed are making to the environments and lives of those whom they connect and communicate with. Thank you for a wonderful year and we look forward to seeing what you all get up to in 2017!! 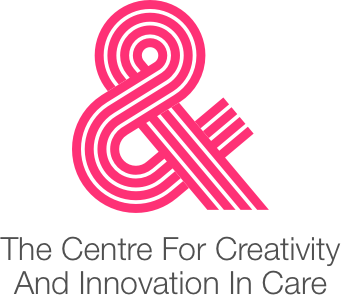 Maidstone Care Centre tell us what it was like to "Think outside the box!" There was much excitement on the day Maidstone Care Centre received their very first ‘Ladder to the Moon’ box. Although the activities team were aware of its contents, the residents had no idea what was inside or how it might be used to entertain, stimulate or lead to anything that might be of any particular interest to them. For them it was black box containing… well, they had no idea. "On opening the box we revealed a selection of photo props directly related to film stars from yesteryear. It didn’t take long for residents to begin recognising actors and actresses, searching their brains for film roles and swapping anecdotes relating to trips to the cinema or ‘pictures’. Many residents were keen to try on the hats and accessories and more than happy to have their photo taken. It was a positive experience for Daphne, who had not been involved in activities until this stage, relishing the idea of taking on the role of Audrey Hepburn and Ernest beaming at the camera in his Charlie Chaplin hat. Our first box had clearly been a success and we thought that by the end of the session we had utilised it effectively. However, it was then that Colin started to speak about his time in the army and the subject of uniforms was mentioned by a member of the activities team. It was then suggested that we might take the ‘dressing up’ a stage further by bringing in some armed forces uniforms in order to allow the residents the opportunity to reminisce. A week later we were fortunate enough to acquire army and navy uniforms from a local theatre’s wardrobe department and brought them in for any interested residents to see, touch and possibly try on. Colin was keen to dress up in the army officer’s uniform and appeared to enjoy having his photo taken, a copy of which was printed and framed for him. This now has pride of place on his window sill. Due to the small sizing of the uniforms it was not possible for all residents to try them on, therefore, Amy, our Activities Co-ordinator donned first the Army red cap uniform and then the Wrens uniform and did her own tour of duty around the home. None of us were quite prepared for the reaction of some of our residents or the looks of surprise, amazement and recognition on their faces. Barbara said it ‘was better than Christmas’, Cyril said ‘Oh wow, very good, you look the part’ and Vera kept repeating that she had worn that uniform and tried hard to convince Amy to go off and join the army. But it was the looks on their faces, the sharp intakes of breath and the emotion in their eyes that left us all with a lump in our throats. The whole episode was very touching for both staff and residents and when we printed of the pictures in black and white and sepia the results were like taking a step back in time, which presumably is how it must have felt for the residents involved." "None of this would have come about were it not for our first Ladder to the Moon box, the act of ‘thinking outside the box’ and letting it take you in a direction that touches and hopefully benefits one, some, or all of the residents. The Evidence of Outstanding Activities Competition Autumn The Winner is … Lynne Lovell – Ashley Gardens (Healthcare Homes)! At Ladder to the Moon, our selection panel were impressed with Lynne’s entry as she demonstrated an outstanding, approach to successfully fostering engagement and transformation, using The Great Exhibition activity box. Congratulations to Lynne and all the staff, residents and relatives of Ashley Gardens!